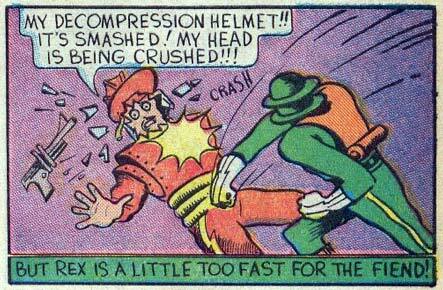 Wait, the helmet decompresses the guy’s head to keep it from being crushed? Is he in the ocean, or something? Shouldn’t it be the other way around for a space helmet (which I assume this is meant to be)? How could I be defeated so easily by a man with a drain plug on his head? As much as I hate being the voice of reason, here goes. Pilots wear compression suits in high altitude (low pressure environment) aircraft, so it sort of makes sense to wear a decompression suit in a high pressure environment like, say, Venus. But it’s probably just random plotonium, anyway. Ooh ooh ooh lookit! That’s me in action! Though I gotta work on that helmet design. Yuck! …..does he have a pencil mustache?